Both Matthew and Luke report Jesus making the statement, “For everyone who exalts himself will be humbled, and he who humbles himself will be exalted.” (Mt. 23:12; Luke 14:11) Jesus seems to imply that being humble or exalting oneself is an act of our will. It is a choice we make. Personal experience and history show that we are not naturally humble. Jesus illustrates his statement with a parable about a guest invited to a wedding feast who picked a place of honor only to be told by the host to move to a lower place so another guest more distinguished than he may take his place. One of the reasons being humble is a choice is that the instinct to survive which is part of our human nature and natural law inclines us to put self first. Original sin involving pride and disobedience also predisposes us to put self first. To overcome our nature and instead be humble, therefore, requires a choice. To serve rather than be served necessitates a decision on our part. Jesus praises such a decision both in the passage above and in the first Beatitude, “Blessed are the poor in spirit, for theirs is the kingdom of heaven.” (Mt. 5:3) Jesus describes himself as “gentle and humble in heart.” (Mt. 11:29) Peter, James and Paul all encourage us to be humble in their letters. Personally, I have to work hard to maintain a humble spirit in all my interactions with others. Too often, my pride overtakes my intentions. We need God’s grace to help us make decisions to be humble. Actions that help nurture God’s grace include daily prayer, the reading of scripture and regular participation in the sacraments. This entry was posted in Humility and tagged Humility is a Choice on August 30, 2016 by Bill Dalgetty. Is there someone in your life who has invited you to go deeper in your Christian faith and your relationship with Jesus Christ? Are you grateful for the role that person has played? Whatever our relationship with God may be, there is likely someone who was instrumental in leading us to our current level of faith. It may be a parent, a priest or pastor, a teacher or Christian friend. This past week I was blessed to have reconnected with some dear friends, Anne and her husband, Tony, who were instrumental in leading my wife and me to meet Jesus Christ in a new and personal way thirty-nine years ago. We were living in New York at the time. Anne and I were serving as religious education teachers for high school students in our church. I remember Anne always having such a beautiful, joyful smile and encouraging the rest of us. She started to invite me to various spiritual related events, but I would decline. So then she started inviting my wife, who accepted an invitation to a “Week of Renewal in the Holy Spirit.” It was a program conducted over five consecutive nights by some nuns at a nearby parish. Each night my wife would invite me to join her, but I declined, claiming to have a brief case full of work. At that time in my life I was more focused on my career as an attorney than I was on the Lord. On the fourth night, my wife came home absolutely radiant. She said she had been prayed with for the baptism in the Holy Spirit. I decided that I had to go to the final night to see what this was all about. On that evening I met Jesus Christ in a new and personal way. I, too, was subsequently prayed with for the baptism in the Holy Spirit, and God started the process of changing my life. My outlook and priorities all began to change as God became the center of every aspect of our lives, impacting our marriage, family, career, ministry, friendships, etc. After almost 40 years, we have experienced countless blessings as a result of this invitation from Anne to go deeper in our faith. We have been blessed in our marriage, in the raising of our five children and seeing them now raise Christian families of their own. I became involved in a ministry to encourage people to live out their faith in their work, and we have been surrounded and supported by many Christian friends in our church and community. Today, we live in Virginia, and Anne and Tony live in Pennsylvania. We had lost contact with them for a few years after they left New York, but it was such a blessing to have visited them this past week, reminiscing and catching up on our respective families. How grateful we are for Anne and her invitation for us to go deeper with Christ! “A faithful friend is beyond price, no sum can balance [her] worth. A faithful friend is a life-saving remedy.” (Sirach 6:15-16) How urgent it is for us to invite others to come to know Jesus through our word and example! Our world is in desperate need of him. Have you invited anyone lately to get to know Jesus more, to check out your church or just to encourage them in their journey with the Lord? This entry was posted in Invitations to Jesus and tagged Grateful for invitations to meet Jesus on August 23, 2016 by Bill Dalgetty. Are You a Peer Minister? God personally ordained peer ministry when he decided to become one of us, his created, in the person of Jesus. He experienced all of the trials, pain, sorrows and joys of our human condition, and showed us how to understand and live our lives. He set both the precedent and the model for us to follow. St. Paul affirms this model when he says, “Praise be to the God of all comfort, who comforts us in all our troubles so that we can comfort those in any trouble with the comfort we ourselves received from God.” (2 Co. 1”3-4) Paul is suggesting that whatever comfort we have received from God relative to troubles we have experienced, we should offer that same comfort to others who are experiencing similar troubles. This is what peer ministry is all about. We all have the opportunity to be peer ministers. There are of course many examples of peer ministries. Alcoholics Anonymous is probably one of the most recognizable – recovering alcoholics helping those struggling with alcohol and other addictions. There are numerous Christian peer ministries to high school and college students such as Teen Encounter, Young Life, Campus Crusade, and Fellowship of Catholic University Students. 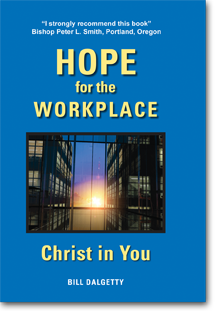 For many years, I have been involved with Christians in Commerce, a ministry to encourage and equip Christians to meet the challenges of living out their faith in the workplace. We share both our failures and successes in order to impact our work environments for good. Then there is personal peer ministry arising out of the personal challenges we have experienced that we can share with others who are experiencing the same kind of challenge. For example, our fifth child, Emily, was born with Down syndrome and serious heart complications. The first few years were very challenging, but we also began to experience the blessings of Emily’s big beautiful smile, her unconditional love, and purity of heart. It has been 30 years since Emily’s birth and we have been able to offer our experience dealing with both the challenges and the blessings to numerous couples who have given birth to children with Down syndrome. Someone who is struggling with a particular problem doesn’t want to hear from another who does not understand what they are going through. If we have experienced the same problem, then we have credibility. We have walked in their shoes. We can speak from our own experience with authority. We can be real. Add God’s love to that experience and you have a peer ministry, which offers comfort to another with the comfort we have received from God for the same kind of problem. What kind of trial in your life have you experienced that enables you now to support a friend or acquaintance going through a similar trial? This entry was posted in Peer Ministry and tagged Being a Peer Mentor Like Jesus on August 16, 2016 by Bill Dalgetty. There is a common notion among many Christians that the kingdom of God is only to be experienced after death. Yes, if we abide in God and seek to do his will, there is a heaven that awaits us upon our passing from this life, a resurrection that follows, and an eternal life with the Father in a new creation. But so much of what Jesus said to his disciples and the people of his day exhorted them to do something with this life in order to advance the creation that God had inaugurated and Jesus had redeemed. Jesus says when we are “born again” (accept Jesus as the Son of God)…and “born of water and spirit” (baptized), we enter the kingdom of God. (John 3:3, 5) Most of Jesus’ parables illustrating the kingdom of God instruct us how to live now, not after we get to heaven. The kingdom is like a mustard seed that grows from the smallest seed into the largest of plants. The Kingdom is like the leaven of yeast, a small amount impacts the larger dough of the world. The kingdom is like a treasure hidden in a field, leading us to give all to buy the field. Jesus says if we love him and obey his teaching, the Father will love us and both the Father and Jesus will make their home with us. (John 14:23) Through their residence in us, we have the opportunity to experience the fruit of the Spirit (love, joy, peace, patience, kindness, goodness, gentleness and self-control (Gal. 5:22-23), and share that fruit with others. Not long ago I learned that a particular friend had lost his wife to cancer. While speaking to someone who has just lost a loved one can be awkward, I felt like the Holy Spirit was nudging me to go see him. When he came to the door, I said, “I came to give you a hug.” He appeared to be all alone and invited me in. For the next hour, I listened to him talk about the last few months of his wife’s suffering, the last few hours of her life, and of all the support he had received from friends, his pastor and medical personnel. I listened as he reminisced about their life together. My time with him, as well as the subsequent funeral celebrating her life, was an example of the reality of the kingdom of God here and now. This entry was posted in The Kingdom of God and tagged God's Kingdom Here and Now on August 9, 2016 by Bill Dalgetty. Have you ever heard a eulogy at a funeral commemorating the deceased for his or her wealth? Eulogies are usually about how someone who has been a good father or mother, a loving husband or wife, or a faithful friend. We hear about attributes such as being kind, gentle, patient, diligent and loving. We listen to stories about how they have served others instead of themselves, how they have been generous with their time and resources, and how they have volunteered for this or that cause. Throughout recorded history people have been consumed with accumulating money and possessions in order to maintain their lives and achieve some level of security. When we start out in life with little or nothing, money is of course necessary to take care of ourselves and to be self-sufficient. As a young attorney for a large international oil company, I was very career focused early on in my life. Marriage and children started to temper that focus. Then I experienced an encounter with Jesus Christ, and a renewal in my faith that led to some challenging choices between career and family, and later between work and ministry. When a reporter asked John D. Rockefeller, who at the time was considered the richest man in the world, how much money is enough, he responded, “Just a little bit more.” Although Rockefeller used a good part of his surplus wealth to build hospitals, support education and other causes, his response demonstrates how insidious accumulating wealth can be. This entry was posted in Wealth Perspectives and tagged Wealth vs. Things Eternal on August 2, 2016 by Bill Dalgetty.